Bang Krachao is an oasis in the heart of Bangkok. Have fun cycling on the bamboo bicycle together with me, your Local Expert, who will take care and provide you activities and knowledge during the trip! Sounds good? Join me! Take a Tuk Tuk or Taxi to the pier. Take a ferry crossing the Chao Phraya River to Bang Krachao. Get a welcome drink, and choose a comfortable bamboo bicycle to bike your way through! Go cycling on the narrow elevated walkways. Here, you'll get an insight in the daily local life. Visit a local mushroom farm and lean how the local mushrooms in the tropical areas are grown. Now, you can sample some mushroom drinks and fried mushrooms products! Next, we cycle through the fields and over the water village. Go see coconut trees, and visit farmlands where fruits and vegetables are grown. We can also enjoy a marvelous view of Bangkok from the pier, right here! Visit the Siamese Fighting Fish Gallery where you'll be learning about the different colors and a variety of species of the Siamese Fighting Fish! Let's head to Sri Nakhon Khuean Khan Park and Botanical Garden! Here, you'll get to explore the bird watching tower and also do some fish feeding! Ride back to the station and get ready for the next exploration together! Arrive at the Herbal Incense House (a.k.a. Baan Toop). Enjoy to making and leaning about the herb incense and Thai Tie Dye! Let's head over to Bang Nam Phueng Floating Market. Here, you can enjoy a Thai Traditional Massage for an hour! Time to head back to Bangkok! Arrive at the BTS station to end the trip! I hope you enjoyed my trip! Additional Local produces will be pending on your decision Expense. 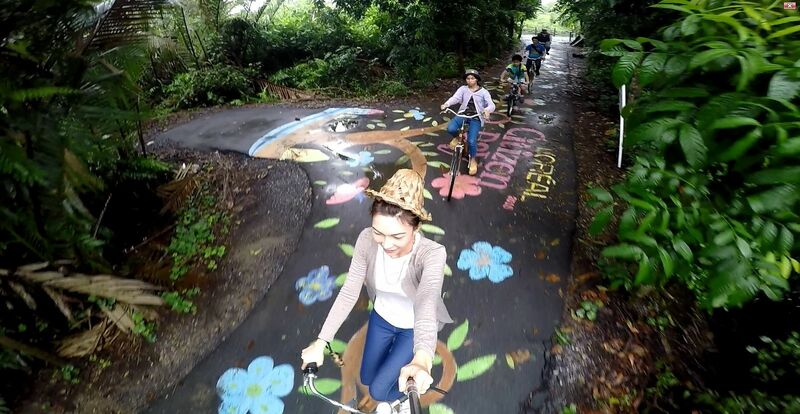 It’s so much fun biking down these peaceful lanes, with forest spilling over on either side plus self leaning and experience activity that can make Bang Krachao is a fantastic place to escape the rush of Bangkok for your fulfill vacation. Try to bring fast-drying clothing, from undergarments to pants and shirts. Hat, Sunglasses and UV protection. Please have the breakfast before pick-up time. It would be difficult to give Polly too much praise for her tour of Ayutthaya. She is an amazing guide who very much wants you to have a memorable experience, and it is quite effective at making that happen. She’s extremely knowledgeable with respect to both the history of Ayutthaya, and it’s Influences on modern culture. She knows the best places to go, when to go, works with excellent people, and is a VERY dedicated photographer. All of the logistics were incredibly smooth. Where ever you go, she will act on your behalf, from finding shady spots to rest to sending back that tea that wasn’t what you were expecting. I could keep going but you get the idea. If you can book a tour with Polly, do it. Tour the Most Exclusive & Beautiful Secret Beach to Explore Sea Life! It was fantastic and great history of my life. The trip was really fantastic and the guider polly is very friendly,caring and good command of english.we really thanks to polly for her outstanding knowledge and experience in tousrim. Thank to Take me tour and polly for made our trip awesome . We had a magic day with Polly. She catered the itinerary to our needs and we felt very spoilt and well looked after. Ayutthaya is amazing. I would recommend this tour to anyone interested in Thai history.